Last month, ONS released the latest statistics for drug-related deaths in England and Wales, which made for sobering reading. Yet again, the number of drug-related deaths has risen to the highest level since records began in 1993. In 2016, 2,593 deaths associated with drug misuse were recorded, a 4.6% increase on the previous year. For England, the mortality rate of drug misuse was 44.1 deaths per 1 million of the population in 2016, up from 42.9 deaths per million in 2015. 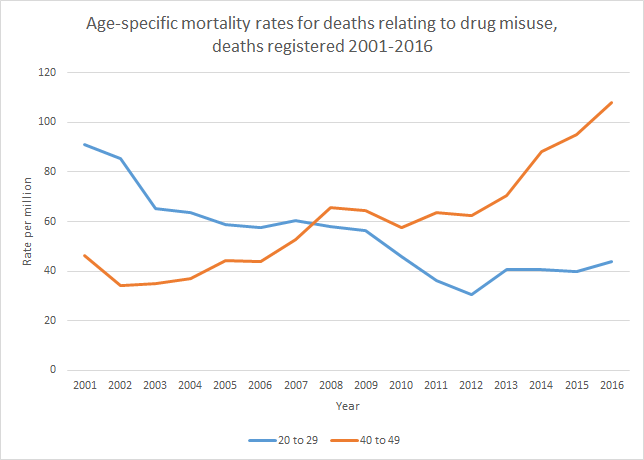 This is not a statistically significant increase, but nevertheless highlights the worryingly high rates of death from drug misuse. The rise in drug-related deaths is largely driven by the ageing population of heroin users who started using at the height of the heroin epidemic in the 80s and 90s; the mortality rate for drug misuse among those aged 40-49 has increased from 95.1 per million in 2015 to 108.0 per million in 2016. Public Health England has pointed out that deaths among this cohort are being driven not just by their heroin use, but also by other factors such as homelessness, poor mental health, alcohol misuse and smoking. However, this is not the only group at risk. Despite the mortality rate for those in their 20s having halved in the last 15 years, there has been a very slight increase among this age group from 39.8 per million in 2015 to 43.7 per million in 2016. While this is not a statistically significant increase, it will be a cause for concern if it persists in future years. The Advisory Council on the Misuse of Drugs, which advises the Government, cites evidence in its report on reducing opioid-related deaths that treatment for addiction to opiates such as heroin and morphine is shown to prevent hundreds of deaths annually. It makes clear that the most important among its many recommendations in relation to reducing drug-related deaths is that investment in such treatment is maintained. This is underlined, the ACMD says, by the fact that areas which experience the highest rates of drug-related deaths are among those that have experienced the greatest reductions in funding for local authority services and welfare benefits for working age adults. Maintaining investment in drug treatment must therefore be included in any conversation about reducing drug-related deaths. This point is given even greater emphasis in the ACMD’s report into commissioning published this week which describes disinvestment from treatment as significantly compromising the potential for treatment to reduce deaths. There is no silver bullet to reducing drug-related deaths. The causes are complex and historical, the interaction with age, poor health, and poverty means that many of the solutions lie outside the treatment system. 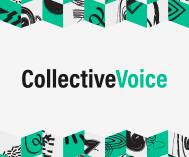 Solutions need to be tailored to different localities and reflect individual need. We know treatment can save lives; the CV/SMPA report provides a toolkit to prompt every service provider to focus their efforts to best effect.